If you want to mount any 1/2x28 TPI threaded accessories on your Colt / Umarex 1911 .22LR handgun, such as a suppressor, a flash hider, or a fake suppressor, this is the part that you need. 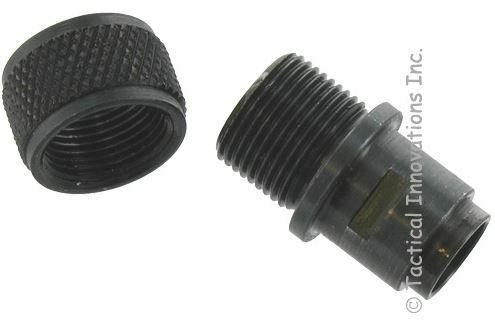 This thread adapter easily replaces the factory barrel nut and provides the external male 1/2x28 thread. The adapter is specifically engineered to provide the required shoulder to ensure that your suppressor is correctly aligned when screwed on to the adapter. The additional alignment shoulder diameter necessitates that you unscrew the adapter as a function of disassembling the pistol for cleaning which also ensures that you will be able to remove it in the future when desired even after shooting thousands of rounds.